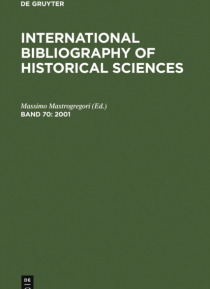 Annually published since 1930, the International bibliography of Historical Sciences (IBOHS) is an international bibliography of the most important historical monographs and periodical articles published throughout the world, which deal with history from the earliest to the most recent times. The works are arranged systematically according to period, region or historical discipline, andwithin t… his classificationalphabetically. The bibliography contains a geographical index and indexes of persons and authors.